A GMO free forage option. Ideal for horses with respiratory issues, poor dentition and those with poor quality hay or hay shortages. 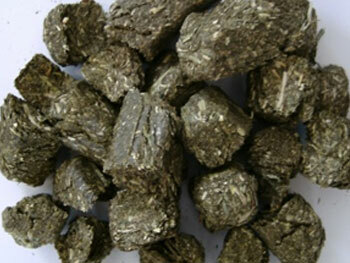 Replace all or part of your hay with Triple Crown Premium Alfalfa-Timothy Forage Cubes. Comprised of pre-bloom alfalfa and immature Timothy hay, the heat produced during the cubing process virtually eliminates dust, mold and fungus. If replacing all the hay in the diet, feed 1% to 1 1/2% of body weight per day. If feeding as a supplement to hay, feed 4 to 6 lbs. of cubes per day. Cubes can be soaked in warm water to loosen for older horses with bad teeth or for horses prone to choking. Store cubes off the floor and out of direct sunlight. Because fiber consumption encourages drinking, always provide plenty of fresh, clean water at all times. NOTE: Keep product fresh in cool, dry storage. Examine product daily for mold or insect contamination. DO NOT use product that is old, molded or insect contaminated. Thank you Triple Crown for being a huge part of his amazing transformation! 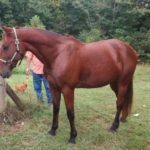 I am writing to tell you how much I loved your feed and send you three pictures of my horse Miller, a 14 year old Standardbred and former Amish buggy horse that I rescued from going to slaughter at the New Holland Auction in November of 2013. Look how far he’s come in just a year. Thank you Triple Crown for being a huge part of his amazing transformation! This picture is the day I bought him and two others to follow.